Despite what the Insane Clown Posse claim, scientists have known how magnets work for quite some time. The cool thing about a magnetic field is that it’s technically stronger than the gravitational field. If you hold two magnets in your hand while standing up, the magnetic field keeps them together versus one plummeting to the ground! ICP is right, it IS like magic! Also like magic is how customers can become “magnetized” to your business. All of a sudden your company is inundated with people ordering things left and right and you have no idea why. Seemingly on a whim, tons of folks have become attracted to your store and products and you have no idea why. But there’s undoubtedly some reason why you’ve suddenly got so many fans. It may seem like “magic” but looking at your PR efforts can show you the secret. It can be both enthralling and frustrating when you have a sudden influx of business. While it’s wonderful to have money coming in, you still want to know which of your efforts was the one that truly “magnetized” your audience. Why? Because you can build an entire PR movement based on the results of your findings. If you know your witty and insightful Twitter feed was the cause of your success, you can build upon it so it’s the focal point of your strategy. If you don’t know this info, you may end up killing what’s working. Luckily, a program like Google Analytics can help you determine where the traffic is originating. At least this way you know where to start so you can figure out what you did right. Could it be your awesome Pinterest photos or the links you post on your company’s Facebook profile? Of course it’s even better to figure out how to “magnetize” your customers before you even launch! That takes a magic touch and a lot of luck…but also a lot of personality. What truly ropes people in is a strong sense that the company knows what they’re doing. Whether you come off as fun, serious, or something in between, your business personality has to show your customers that the decisions you make have their best interests at heart. So when designing a PR strategy you think will draw people in by the thousands, keep the people on the other end in mind. If you have a strong business personality you can go far even if you just try a bunch of strategies to see what works. When your customers latch onto you, not even gravity will tear you apart! 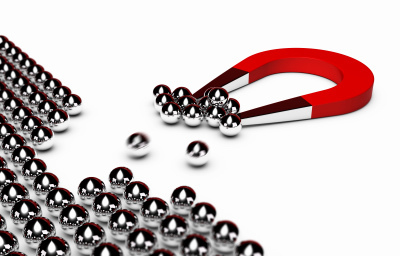 What have you found magnetizes your customers?